Hotel Alpino Atlantico is a 4 star Hotel situated in a peaceful street in Canico de Baixo, on a cliff 50 m above the sea. There are 4 stages with in total 27 modern and comfortable rooms. Alpino Atlantico belongs to the group of Galoresort Hotels. Other hotels in this group are hotel Ondamar (a 4 stars sports hotel) and hotel Galomar (3 stars), both also situated in Canico de Baixo, and also the 4 star Hotel Calheta Beach (in Calheta). Situated in Canico de Baixo, a nice and peaceful village in the sunny south of Madeira in between Madeira International Airport (8km) and Funchal (10km). Arriving from the airport, take the "Via Rapida" (highway) in the direction of Funchal until the exit 'Canico' and 'Canico de Baixo'. After the exit, turn left and follow the road downhill. Follow the markers hotels. The old center of Canico is situated on top of the hill	about 3 km away from the hotels. Visitors to Hotel Alpino Atlantico are entitled to use all facilities of the nearby Galo Resort Hotels. You can use their swimming pools and equipment and towels are provided free of charge. All kinds of welness and spa are available at an extra charge. Very special about the Galoresort is the private bay for snorkeling and scuba diving in the Underwater National Park of Madeira. There is no swimming pool, restaurant and/or bar in Hotel Alpino Atlantico ! Only breakfast is being provided. A few beach chairs are available in the garden. A wealthy breakfast is served with a panoramic Ocean view. At warmer days, which are common in this sunny part of Madeira, the breakfast can be taken outside. The sea view is exceptional and a relaxing start of a perfect day. Half board and full board are served in Hotel Ondamar, 300m away from the Atlantico. A very peaceful environment and enough parking space. Car hire as well as transport from and back to the airport can be arranged by the hotel. There are no set days for arrival and/or departure. The hotel can be booked per night. Hotel Alpino Atlantico features in travel guides of TUI, a German tour operator, hence many of the guests are from Germany. Guests will find a well-filled, free of charge fruit basket in their rooms. A perfect hotel for those looking for a holiday in a peaceful environment or for those who make a tour at Madeira and want to spend a couple of nights in this region. Hotel rates are acceptable for the quality being offered. 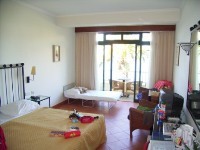 The rooms are very clean and offer a great sea view from a private balcony. There is no sign of flies or mosquitos, only the sound of the waves and a few birds and if you're lucky you may spot a whale in the distance. We Enjoyed our evenings at Hotel Alpino Atlantico, sipping on a glass of Madeira wine while watching the the ocean under a full moon. For those who make a round trip on Madeira, we recommend to select bed and breakfast. There a some good restaurants on walking distance, such as fish restaurant "Atlantis" (that belongs to the same Hotel group). The restaurant is at sea level. The menu offers a lot of choise, including regional dishes and special menus for children. The food is great, prices are acceptable and its location close to the sea adds to the recommendation. Another fine restaurant is the Cerbejaria Alemã on the corner of the main street.